There are many days when I still can’t believe I sold Driving Sideways. Which, when I sold it, was called Riding with Larry Resnick. But then, many things have changed since the day of the sale. I nearly gave up writing in 2002. In fact, I did for awhile. Rejections can be relentless as they chip away at you—you dispatch batch after batch of queries with such hope, sometimes snagging a request for a partial here, a request for a full there, but if you’re continually coming up for air empty-handed, inevitably, you have a moment where you ask yourself: How long can I keep pushing this rock up this hill? I think I danced around the house, skipped down the hallways in my office. I am pretty sure I gushed about the very concept to my colleagues, friends, and family. I remember how proud my husband was when he looked at me, because he’d walked with me to the post office as I mailed those batches of unfruitful queries, he’d watched my face fall as I read the particularly painful rejection letters aloud. “This is really happening, isn’t it?” he asked, a bit of wonder in his voice. “I’m not sure yet,” I replied carefully, more than a bit of wonder in my own voice, too. I looked over my shoulder again. Did she mean me? Was she talking to me? The public servant who grew up with homemade Cabbage Patch dolls and second-hand clothes? On the blizzardy drive home, I nearly hit a flock of wild turkeys crossing the highway. And when I got home, I had some decisions to make. I ended up being incredibly indecisive about most of them, but thank God for the insights and advice of my agent. I hemmed and hawed, made things much more agonizing than they had to be. But I made my choice. I picked The One. After I hung up with my agent, I sat still for just a second, tears welling in my eyes. I did it, I thought, looking at my dog as she looked quizzically back up at me. I actually did it. Then I called my husband at work, my brain buzzing with what had just transpired in my quiet living room, the thin white winter light filtering through the windows, making everything looking like a dream. But it was a dream I actually ended up believing, because it really came true. PS: the rollercoaster only began with the sale, as my editor left HarperCollins for Random House in the summer of 2006…and wouldn’t you know, I got to come with? great story jess. I think we writers veer toward imposter complexes whenever we have an inkling of someone other than us or close relatives actually liking our writing. Its so funny but I guess its due to such continued rejection–works charms on the morale, doesn’t it? Another honest and wonderful story. What Jenny said about the imposter syndrome–didn’t Sally Field say it best, “You like me you really like me! Jenny you’re right – in this business we get so used to ‘failing’ (being rejected) that sometimes it comes as such a surprise when someone loves the work. And who hasn’t thought of packing it all in? 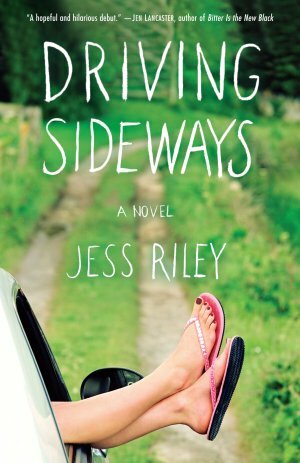 Great story, Jess, I’m looking forward to reading Driving Sideways. It’s so hard in this business to keep going and fabulous to read examples of other writers who didn’t give up. Absolutely inspiring!!! I also LOVE the turkey detail! I love these sale stories! More! More! Thanks for chiming in, everyone…I think we may need to name this feeling the “imposter complex.” 🙂 Have a great weekend! Oh Jess, loved this story and I’m so happy you didn’t give up! Thanks! “After I finished the first two chapters of a book I was writing, I read them and grimaced…I was ready to pitch the chapters, and my writing career, out the window. A writer friend called…and told me: “Those chapters are fine. Stop being afraid. Stop criticizing yourself. And keep on writing.” I followed her advice. The book was ‘Codependent No More’ and spent over three years on the New York Times bestseller list. What a wonderful story! Just reading it gave me that “effervescent” feeling. Great story. I remember reading an interview with Alice Sebold about a year after The Lovely Bones had hit the NYT (and every other) list where she described how she still didn’t feel like a “real author”. I think we all have those feelings sometimes. You know in the Velveteen Rabbit, if a child truly loves a toy, it becomes real? It’s the same thing with authors: At least one person loved your story enough to make it into a book. Which means, my dear, that you are the real thing.